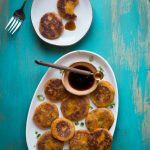 Learn how to make this naturally gluten-free sweet potato pancakes made with mashed sweet potatoes, glutinous rice flour, and scallion. Perfect side dish or as a snack. Place all ingredients for dipping sauce in a small saucepan and just cook until sugar is melted. Remove from the heat and set aside.